Up until today, my blog was hosted at http://www.ericdaugherty.com/blog using Blogger's FTP publishing service. This service uploaded html files to my GoDaddy hosting account whenever a new post was created. While it worked reasonably well, and I liked the control it provided (since I had a backup copy of my entire blog on my hosting site), it did have a few issues. While I was not excited about moving my blog, I understood Google's reasoning. Google provides a 'Custom Domain' publishing option, allowing Google to host the blog using a DNS name that you own. In my case, I chose http://blog.ericdaugherty.com as my new custom domain name. I could not keep my current address because Custom Domain publishing does not support publishing to subdirectories. 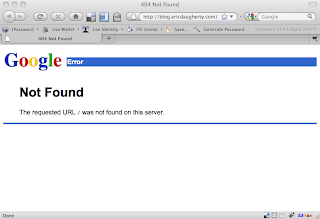 My first step was to create the blog.ericdaugherty.com CNAME and point it to Google's hosting DNS name, ghs.google.com. I use GoDaddy as my registrar and DNS Server and the changes took effect almost immediately. To test, I opened the new address in the browser, and was greeted with a Google hosted page that stated 'Not Found'. Good so far. Step two was to update my blogger configuration to use Custom Domain publishing with the blog.ericdaugherty.com CNAME. I also used the 'missing files' host option to host all of the pictures I'd uploaded previously. I used my existing host at www.ericdaugherty.com to host the missing files. I hit save and reloaded the site. It immediately loaded, but was missing all of the formatting and images. My template assumed it was being loaded from www.ericdaugherty.com, so the links to my images and style sheets were broken. I use FeedBurner to track my RSS subscribers, so I updated my FeedBurner settings to point to the new URL. If I had not used FeedBurner, I would have needed to add a redirect to my .htaccess file (see below). So I just needed to add the new rewrite rules using a 301 (permanent) redirect to notify any requesting agents (including search engines) that the content has been permanently moved. I also included a redirect for my old rss.xml file to the FeedBurner URL, to make sure anyone who had directly subscribed to the feed was instead using the FeedBurner version. Finally, I excluded the uploaded_images directory, as the hosted blogger site will still reference those images for the old blog posts. That's it. It took a bit of effort but wasn't too bad. If you are reading this post you, then the new settings are working. Let me know if you see any errors!